The story of Lord George Gordon, firebrand political agitator turned pious Jew, is one of the most curious episodes of early modern Jewish history. A British aristocrat whose anti-establishment views irritated his peers, his involvement in the violent riots that bear his name was extremely controversial. But much more stunning was his unexpected subsequent conversion to Judaism and imprisonment for libel. In this two part series we will discover the origins of this eccentric aristocrat, and follow the twists and turns of his rollercoaster life. About ten years ago I selected as part of my summer vacation reading the recently published biography of William Pitt ‘the Younger’, Prime Minister of Great Britain for some twenty years during the latter part of the eighteenth century and the early part of the nineteenth century. The book was excellent, written by William Hague, the youthful former leader of the UK’s Conservative Party and Parliamentary opposition, who later served as Britain’s Foreign Secretary. In describing the background to Pitt’s remarkable ascent to the position of Prime Minister at the tender age of 24 in 1883, Hague mentioned the notorious Gordon Riots of 1780, the worst outbreak of civil unrest in modern British history. The riots were named for a man called Lord George Gordon, a young, devoutly Protestant, anti-Catholic agitator, who, as a member of the British parliament, was trying to reverse the recent repeal of the anti-Catholic laws. His role as the actual instigator of the riots was dubious, as we shall see, but the effect of a week of widespread uncontrolled violence was extremely significant at the time, whoever was ultimately to blame. I recalled having previously heard about Lord George Gordon in some kind of Jewish context, but could not quite remember the details. In those pre-WiFi days I was unable to instantly turn to Wikipedia to pin it down, so I made a mental note to research Gordon when I returned to London after our vacation in Israel. That was August. For one reason or another I never checked him out and now it was the month of November. Finally I began my research and what I discovered was utterly remarkable. Lord George Gordon, the Protestant firebrand of the eponymous Gordon Riots, later abandoned Christianity and converted to Judaism, to become a fully-fledged, mitzvah observant Jew, even adopting the beard and clothing of the Polish Jews of his day. More remarkably, he died in jail relatively young, after being incarcerated for five years for the ridiculous crime of insulting the French queen, Marie Antoinette. I was so intrigued by this story that I began to look for any books that could better inform me about Gordon and his background. Charles Dickens wrote a fictionalized account of the riots called Barnaby Rudge, and a number of political history books describe Gordon during that period. But his conversion to Judaism, which is what really interested me, always seemed to be a footnote. There was, however, one book that caught my eye. Written by his faithful secretary, Robert Watson, it was published just two years after his death, in 1795, but was never subsequently republished. I scoured book dealer websites to see if I could get my hands on a copy and eventually found one at a rural secondhand bookstore for £125. I called the owner to ascertain the condition of the book, and we agreed a slightly lower price, but I told him I needed to think about it and that I would call back to confirm, or to cancel. Reb Yisrael ben Avraham Avinu Lord George Gordon. Who exactly was this enigmatic convert to Judaism? What was his background? How did he come to be identified with the violent insurrection that bears his name? 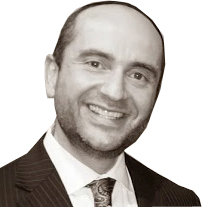 Why did he become a Jew, and when did it happen? And last but by no means least, how was it that he ended up dying in jail? Lord George Gordon was born into privilege; the Gordon family was a ducal dynasty from Scotland. The first duke, also called George Gordon, was originally known as the Marquess of Huntly. A Catholic, he supported James II, the last Catholic monarch of Great Britain. His grandson, the third duke, was Cosmo Gordon, and he was our protagonist’s father. Cosmo married his first cousin, Catherine Gordon, a feisty woman, and the entire Gordon family was widely considered to be eccentric. George was their fourth son, born in 1751. Cosmo died the following year, and Catherine was soon remarried to someone seventeen years her junior. The young George was unsurprisingly a neglected child, and at the age of 11 he was packed off to boarding school at Eton. He never returned home. After Eton his mother arranged for him to become a commissioned officer in the British Navy, and within a year he was at sea. By nature a social activist and very outspoken, the new young officer made himself unpopular with his seniors by trying to raise the general conditions for ordinary sailors, and the admiralty board concluded that he was ‘wholly unsuitable for promotion’. On shore leave in the American colonies he became fascinated by the social conditions of the blacks, both slaves and freed slaves, whom he concluded were very badly treated by the whites. Gordon was an indefatigable and tireless fighter for causes he believed in and was full of energy, initiative, innovation, and a capacity for hard work and long hours. So it was, at the age of 22, he left the navy and become a member of the British parliament. He began to campaign for a seat in Scotland, endearing himself to local voters by learning to speak Gaelic and to play the bagpipes. He also threw lavish and quite raunchy parties that were open to all, and as time progressed it looked as if things were going his way. The sitting member for that constituency was a man called General Fraser, who was pretty unhappy at the prospect of losing his seat, so he put some pressure on George’s eldest brother, the Duke of Gordon, and the younger Gordon was forced to withdraw his candidacy. Instead, he stood – unopposed – for another constituency in southern England, and joined the House of Commons in 1774. It didn’t take him long to become embroiled in controversy. In speech after impassioned speech he railed at what he saw as the British government’s obsession with subduing restless American colonists through military force. Bitterly opposed to the lack of real democracy in Great Britain because of the direct involvement of the monarch, King George III, he became a vocal supporter of the colonists in their fight against British imperialism. He quickly established a reputation as a great parliamentary performer – a role he truly enjoyed. The trouble was, although he was a fierce critic of the administration, he could be equally critical of the opposition. As a result, in spite of the fact that his approach was independent and refreshing, it was not politically effective – in politics you need allies, and he had none. As the 1770s drew to a close, the political ‘hot-potato’ was the proposed repeal of the Anti-Catholic Laws. It wasn’t that Catholics were particularly persecuted anymore, but the law needed to be changed so that the wording of the oath for soldiers entering the army – which was desperately in need of soldiers for the war in the American colonies – could be changed. The law was drafted, proposed and quietly passed in the late spring of 1778. As the details emerged, however, radical Protestants began to vigorously protest on the basis that Catholics had dual loyalties, because of their allegiance to Rome. Gordon became the leading campaigner against the new law, mainly because he realized that the whole thing was a charade to get more men to fight in the American War, to which he was ideologically opposed. His notoriety and family ties were valuable to radical Protestants, and they appointed him President of the London Protestant Association, a position he gladly accepted, despite advice that he should not. This marriage of convenience would set off a chain of events that would prove to be a disaster for Gordon. In early 1780 the Association began to compile a petition for the repeal of the detested law. Notices went out inviting the public to come and sign the petition at Gordon’s home in Central London. Despite warnings that he was being used by people with less than honorable motives, he refused to resign his position. 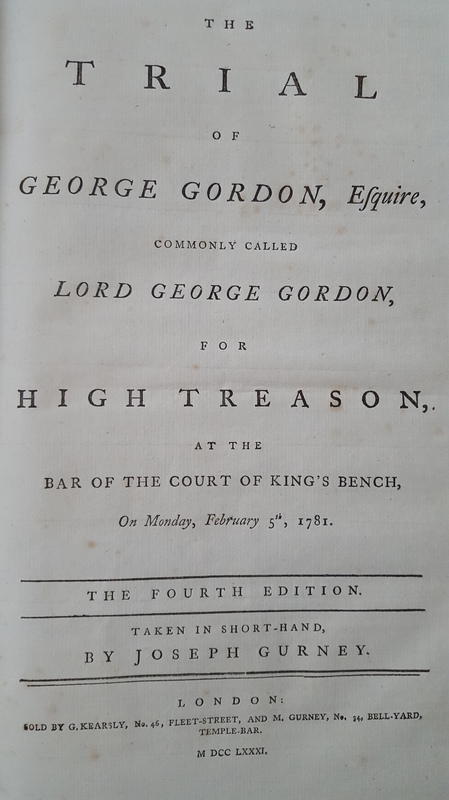 When the Prime Minister, Lord North, refused to present the petition to King George III, Gordon exercised his right as the son of a Duke to demand an audience with the monarch. He met the King three times, but by the third meeting his behavior had become so offensive, that when he attempted to arrange a fourth meeting he was politely but firmly turned away. The King – by nature a tolerant man who was quite happy to do away with England’s outdated laws against Catholics – refused point-blank to recommend the petition to Parliament. But the petition kept on growing until it had 100,000 names. The political establishment began to sense danger. The Prime Minister called in Gordon and tried to bribe him with a significant sum of money and a senior government position if he deserted the Association, but Gordon could not be bought, and instead he called for a public protest on the morning of Friday June 2, 1780. Fifty thousand people turned up to march towards the Houses of Parliament. Initially the rally was peaceful, but the unusual heat that day, and the crowded streets, resulted in the mood changing from peaceful to disorderly, and within a few hours the protestors were out of control. Government officials leaving Parliament were forced out of their carriages and beaten up and their carriages were destroyed. Demagogic speakers ranted against the Catholics and the government. Gordon was in the House of Commons where he got up to speak with the noise of the demonstrators outside clearly audible as he began. He produced the rolls and rolls of paper containing the signatures of the petitioners, and demanded that the petition’s demands be adopted by the elected members. A heated debate ensued. Without exception every speaker opposed Gordon’s suggestion, the petition, and the unseemly protest in the streets below. The debate lasted for over six hours and a vote was finally taken in the late evening. Gordon’s motion was soundly defeated 190 to 8, with no abstentions. Troops were then called in to disperse the demonstrators, and everyone went home thinking that the saga was finally over. But by midnight gangs of drunken violent men began a rampage across London. The violence would last an entire week, and as each day progressed the anarchy increased, and the carnage escalated. The homes of leading politicians were burned the ground. Catholic churches and homes of leading Catholics were attacked and looted. Prisons were broken into and prisoners freed. Eventually the military were mobilized with shoot-to-kill dispensation. Within hours hundreds of rioters had been killed. While all this was unfolding, Gordon came to the realization that his plans had badly backfired. But his attempts to quell the riots as the week progressed were ignored by the mobs marauding through London. He had become irrelevant. A week after the original demonstration, on June 9, Gordon was arrested and taken to the Tower of London. Several of the leading rioters were also arrested that day and summarily executed for treason. But Gordon’s trial did not materialize for months. Then, in late December, he was charged with High Treason, a crime punishable by the gruesome execution of being hung, drawn and quartered. But Gordon was no common criminal. Although not a respected politician, his aristocratic origins and wealthy family meant that he would be properly defended, despite the grave misgivings over his role in the affair. With financial help from family, friends and sympathizers, Gordon hired the top trial lawyer of the day, Lloyd Kenyon, and his brilliant assistant, Thomas Erskine, to defend him at the trial. Erskine was a devout protestant and a gifted orator. Nevertheless he later wrote that he had advised his client that acquittal was unlikely. The attorney general himself led the prosecution team and the judge was the Lord Chief Justice, Lord Mansfield, whose house had been burnt down. The bets were not on Gordon walking free. In Part Two of this series, discover how Lord George Gordon escaped the death penalty and walked free, only to be later rearrested for insulting the French queen, and the British judiciary. The amazing story of this unusual British aristocrat gets even more remarkable, as he morphs into a pious Orthodox Jew.